Keurig 2.0 K300 Coffee Brewing System With Carafe Only $99! (Reg. $139!) Ships FREE! You are here: Home / Great Deals / Christmas Deals / Keurig 2.0 K300 Coffee Brewing System With Carafe Only $99! (Reg. $139!) Ships FREE! 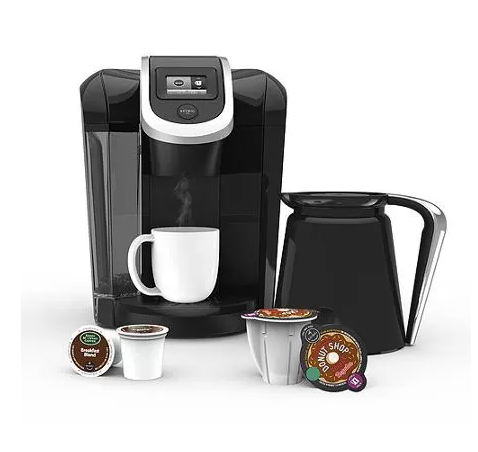 Head over to Walmart and get the Keurig 2.0 K300 Coffee Brewing System With Carafe Only $99! (Reg. $139!) Shipping is FREE! Or opt for FREE store pickup if available to you! The K300 series brewer allows you to brew a 4-cup carafe with the same ease and convenience of brewing a single-serve cup. A welcome departure from the typical coffee maker, the K300 brewer features Keurig 2.0 Brewing Technology, designed to read the lid of each K-Cup or K-Carafe pod to brew the perfect beverage every time. Other brewer features include a 60-oz water reservoir, 2.4-inch interactive black and white touch display, and a strength control setting for brewing bolder coffee!